sock prØn. : plain and FANCY new yarn, p-words done! plain and FANCY new yarn, p-words done! Eek!! Margene (yeah, her! can you believe she mailed me something?! to my ADDRESS??! i'm a terrible dork, i know...) sent me this after drawing my name from her one word comment challenge... I said skyful. :) I know, its not a real word. Phew, and if that wasn't enough for a great weekend-- I finished my Pomatomii. We should play "what's under Aija's couch?" but, you really don't want to know. 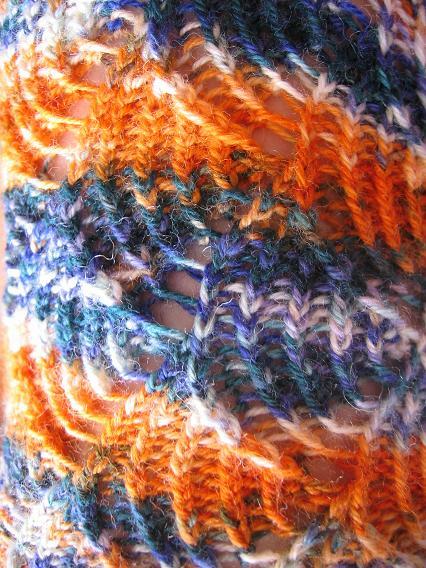 Of course, the orange shows the stitch the best. I think the purple/white/green is too busy to see any of it. But I do like the way it looks over striping, both the wide leg stripes of #2 and also the feet of both. That's very pretty. 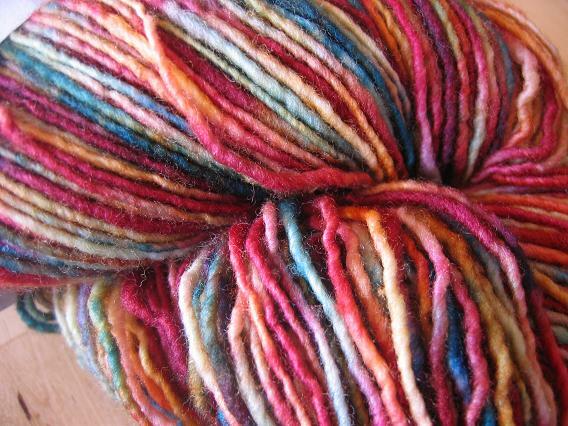 Can you tell us the make up of the yarn - is it 100% wool? Thanks. Thanks for the tip about trek's sock bag trade! I snagged one of her original retro pinky bags before she ran out and I am so excited to receive it! Your site rocks!! That first yarn is very pretty. If you find a website let us know! That yarn is yummy! And I love those potomi - they still remind me of goldfish. The pomatomus turned out perfectly; hope you get lots of wear out of them. i'm jealous! what pretty yarn...can't wait to see it knit up! Wow! Gorgeous yarn and socks! I love the made in America from American wool. The Plain and Fancy is gorgeous! I love the colors. I don't think I've ever used a single ply as a asock yarn. I'll be eagerly waiting to see how that goes. I love the orange pooling parts (surprise!) 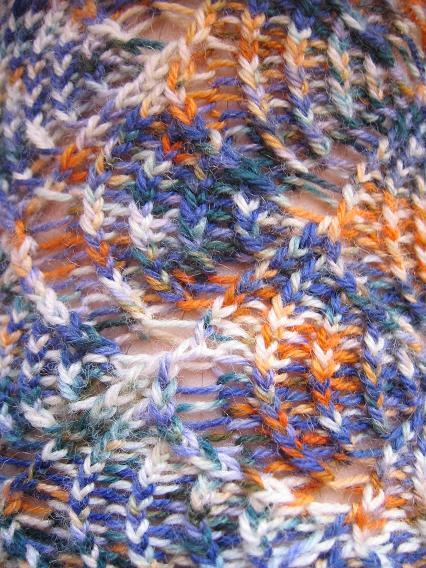 I saw that sock yarn on her blog and loved it! I think it is the new Brooks Farm sock yarn that they only sell at festivals! As always, great job on the socks! The Poms turned out beautifully! Isn't it so weird how the two turned out so differently. I really like your new yarn! I think Crusoe would be really nice in it. Your Pomatomus socks are wild! Love 'em and can't wait to see what you get out of the new yarn. You lucky duck you!! I think I commented yesterday - love your blog-it's one of my favorites- and all your beautiful yarny pictures and gorgeous things you make! You are an inspiration. 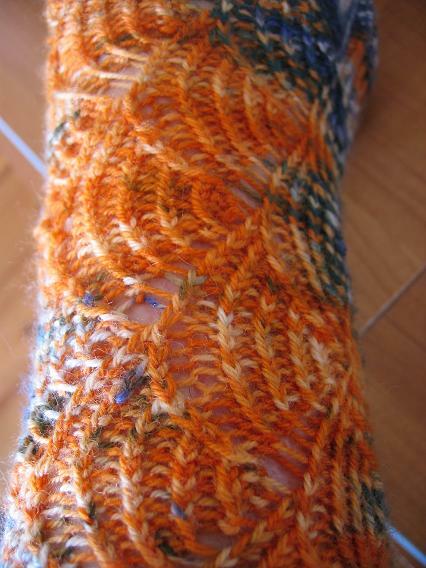 I love the yarn photos and stitch pattern close ups - and the socks are gorgeous!! Beautiful P-word socks!! Can't wait to see what you do with the P&F yarn. You showed the colors of it so well. Enjoy! I'm wondering how those great socks are to knit. You seem to have lots and lots of fun with them. I'm loving doing two at once on one circular needle. I might need some variety in patterns. *sigh* So much sock yarn, so few patterns I have. the Japanese "wave" look works!! very special socks, and great close ups. First time commenter....long time lurker. The new yarn is beautiful. Can't wait til it grows up into Crusoe. *drool* the plain & fancy is unbelievable, i am terribly jealous. i can't wait to see that knit up. you lucky duck! That is some yummy yarn! And your p-socks look divine. Your P socks are gorgeous!! And the yarn from Margene is very fun! Um, based on what I've heard about Crusoe, you're going to want to make the heel deeper than the Judy Gibson pattern calls for - especially if you're using EoP on the heel. Whole lotta not stretching going on there. Oh! Your new yarn is so pretty, lucky girl. I can't wait to see you knit up the Crusoe socks, will look great in that yarn. 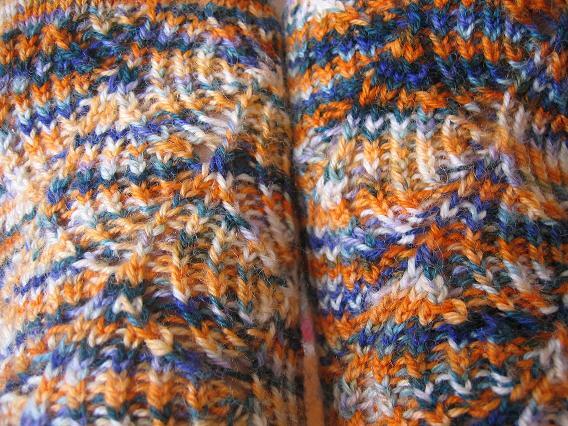 And your Pomatomus socks are great I love the orange in them. 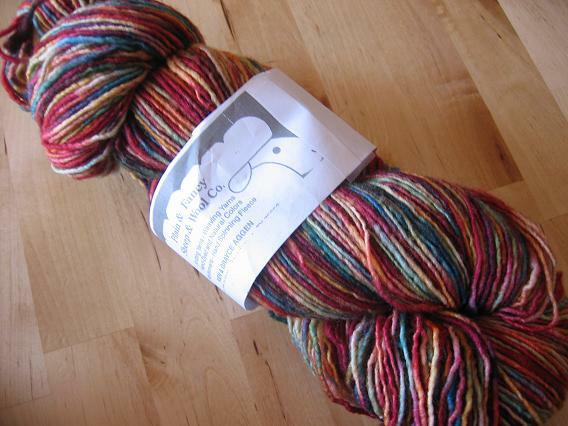 Oh yeah, I'm in sock yarn lust! Whew, that yarn seriously rocks, and so does Margene. Great new yarn, and single ply, wow! 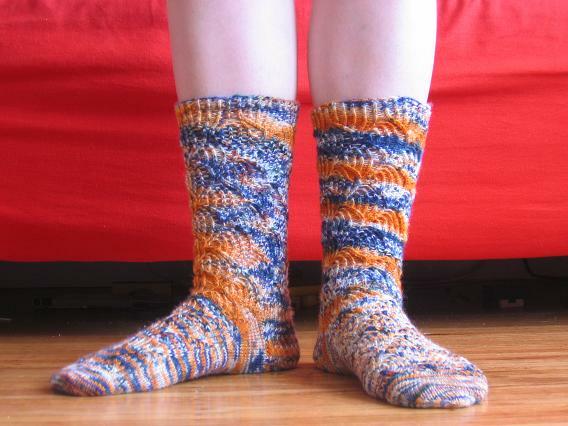 The socks turned out great, they do remind me of goldfish, like someone else said. Love the new sock yarn!!!! The P-socks are faboo! I've got to make a pair.....once I get back on the sock knitting wagon. I seem to have fallen off somewhere along the way. i loooove the new yarn. i'm so jealous of your stash. Great socks! Its wild how different they turned out. And the new yarn looks divine! Hi! I read you just about every day!! 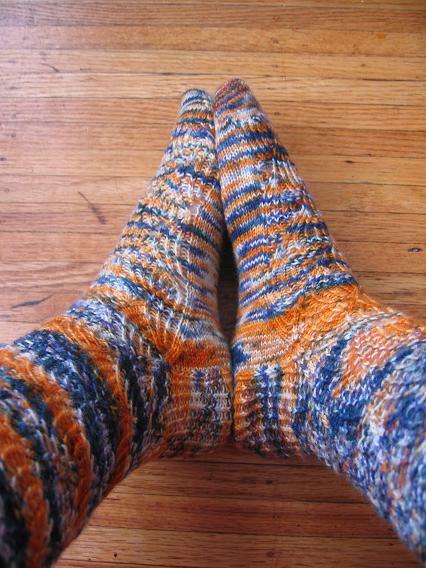 I am going to take a sock class starting this Thursday. YAY!! I am so excited!! Any suggestions for what yarn to use for my first socks? We will be using an Ann Norling pattern. My LYS carries quite a good variety, although they do not have Trekking XXL!